Once again, bacon has made something better: meatloaf. Make plain meatloaf. 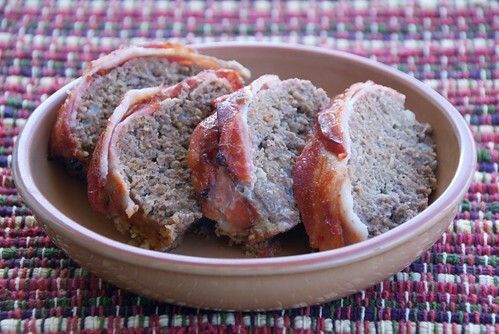 Make bacon-wrapped meatloaf. Then tell me which one is better. Aw, never mind. Just make the bacon-wrapped meatloaf. It's absolutely better. 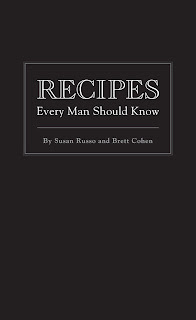 It's also in my book, Recipes Every Man Should Know, co-authored with Brett Cohen. 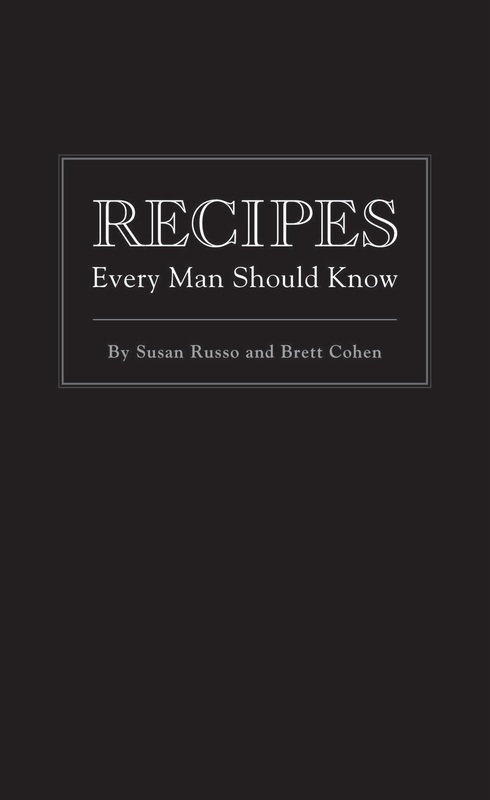 This little, hardcover, black book details a number of recipes that... well, every man should know. You'll find manly breakfasts like Sausage and Egg Breakfast Hash, gut-filling dinners like Jumbalaya, and lots of bacon-spiked foods, including guacamole and brownies! All this goodness for a modest $9.95. Can you say Christmas stocking stuffer? 1. Use the best beef and bacon you can afford. I prefer 85% lean beef. Any flavor bacon will do, so use your favorite. I don't suggest thick cut because it doesn't cook and crisp as well due to the criss-cross pattern. 2. Use your hands to mix the ingredients together. The mixture should be moist yet hold together nicely when formed into a long oval. Pat the sides together with the palms of your hands, then pat both ends to make it hold together compactly. 3. Criss-cross the bacon strips so it looks good. I mean, come on, that's one pretty beast, is it not? 4. Bake it on an aluminum-foil lined rimmed baking sheet for easy clean up. Or, if you have one, bake it on a roasting pan so the fat drips in the pan. 5. To ensure the meat is safely cooked, use a meat thermometer which should read 160-165 degrees. If you don't have one, then insert a knife into the thickest part of the loaf to ensure the meat is no longer pink. 1. Preheat oven to 350 degrees F. Heat oil in a large skillet over medium-high heat. Add onions and saute 3-5 minutes or until lightly browned; let cool slightly. 2. In a large bowl, combine sauteed onions with all ingredients from ground beef through hot sauce, plus 2 tablespoons ketchup. Using your hands, mix until thoroughly combined. Transfer beef mixture onto a large baking sheet lightly greased with canola oil or cooking spray. (You can line the pan with aluminum foil for easy clean-up.) Shape into an oval mound or long rectangle and lay bacon slices over the top so that they crisscross. Wash your hands, then brush remaining 4 tablespoons ketchup over bacon and meatloaf. 3. Bake 50-60 minutes, or until browned on top and cooked through. (A thermometer inserted into the thickest part of the meatloaf should read 160 to 165 degrees F.) If you don't have a thermometer, insert a knife into the thickest part to ensure meat is no longer pink. I think we're having a re-surgence of bacon lately. It's always been around - but I just seem to see it everywhere lately. And not just on dishes like meatloaf. (My Mom always put bacon on top of meatloaf.) But crumbled bacon in veggie dishes and in chocolate and it's all so creative. Sounds like a good book. Maybe I should get it for my son-in-law whose going through a divorce and becoming single again this year. I am definitely not a man, but I love every recipe you've posted from the book! 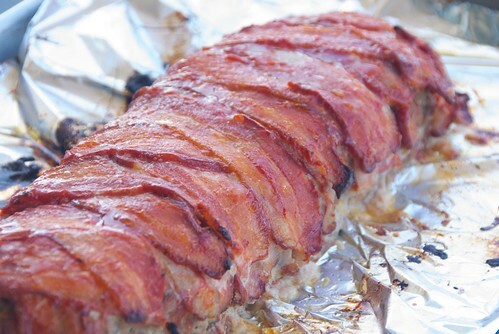 Love meatloaf and bacon wrapped would only make it better. What a fun book. This is definitely going on my post-Thanksgiving list of dishes to make when the leftover turkey runs out! This is very much my recipe with teo exceptions. I use ground pork for 1/4 - 1/3 of the meat and I soak the bread crumbs in milk to make a panade. I do love a good meatloaf and bacon will make it even better! Yours looks delicious. 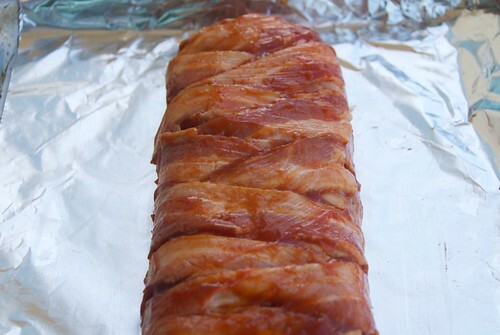 This bacon wrapped meatloaf looks great! Thanks for the post. It must be so exciting to have your cookbook published Susan. Bacon is high on my list of guilty pleasures. That meatloaf looks soooo good!! This sounds so deliciously delightful!! Another delicious reason to buy this lovely book! And will do so in the next post too! Meat wrapped in meat - Fabulous!! Made it this weekend along with bacon/beer/carmelized onion sweet potato - awesome! So my daughter and my son just moved into their first "grown up" apt (meaning they aren't living with me) and she is Loving having her own kitchen. She made meatloaf the other day and didn't love the recipe - I just sent her YOUR recipe and she (and my son's GF) totally agreed that THIS is the next meatloaf she tries. She said to say "Thank You!" What a fabulous dish. This looks hearty and delicious.I hope you are having a great day. I know ONE man who should know this recipe - MY HUSBAND!! :o) Looks suitably deicious!